For many children, their birthday is their favorite day of the year. They get all of the attention they have ever wanted, they get to hang out with all of their friends at the same time, and of course, they get presents. But this is a special day for parents as well. This is the day their little bundle of joy came into the world many years ago. Celebrating your kiddo’s birthday can be exciting for you as well! While some parents may not put a lot of thought into their child’s birthday party past the cake, presents, and friends to invite, others go above and beyond to make sure their kid has the best birthday ever. 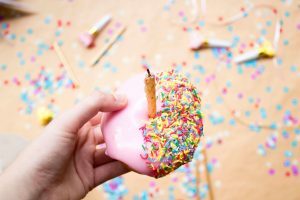 Whether it is an extra special year for your child or you just want to make this birthday one to remember, creating the perfect birthday doesn’t have to be dramatic and excessive! At Jumpin’ Jamboree, we can help you plan the perfect, fun, and exciting birthday party that your kiddo will love! 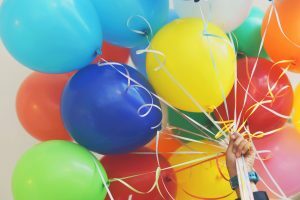 In this blog, we are going to give you tips to help you plan the ultimate, exciting birthday extravaganza! 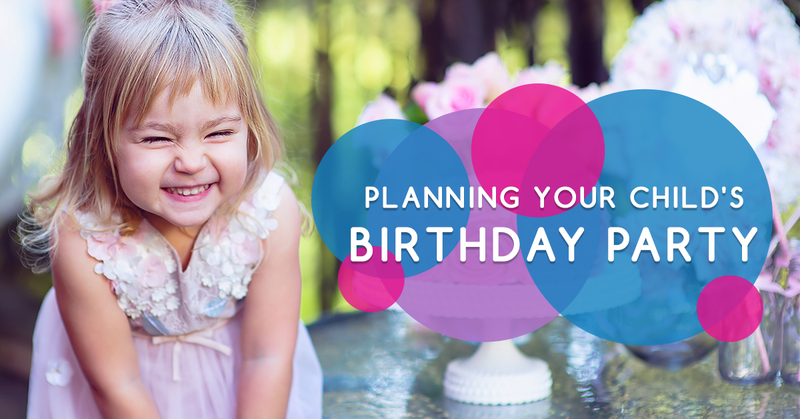 Read on for tips to making your kid’s birthday, from start to finish, one to remember. Breakfast is the most important meal of the day and many children’s favorite, most likely because of all the sugar. Surprise your birthday kiddo with their favorite breakfast first thing in the morning, whether it is French toast, waffles and berries, or the one sugary cereal that you only get on special occasions. Well, this is a special occasion and calls for the sugariest of cereals! Eat breakfast as a family and enjoy some time at the beginning of the day together. This is a great way for your child’s birthday to start! You want to have some quality time with your kiddo on their birthday. We love being around our loved ones on their special days. Before their birthday party starts or before any of your other plans, spend some time with your kid doing what they love. Go to the beach, explore some natural areas, play their favorite board game, or do whatever else they want to do. Maybe they want to go for a bike ride to get ice cream, everyone needs more sugar after a sugar-filled breakfast. Doing something as a family with your birthday child is a great idea before throwing a party. This allows the birthday to be centered around the family and not just the party. If your child loves attention, which many kids do, make sure everyone knows that it is their birthday! Make them a birthday crown, a cape, or something else that they can wear around all day to let everyone know it is their birthday. They will love wearing their birthday gear around throughout the day — it’ll make them feel extra special. Before your birthday kiddo wakes up, hide birthday messages throughout the house. Write a message on the bathroom mirror. Hide a note in their sugary cereal box. And place notes throughout the house that wish them a happy birthday and tell them how special they are. You can hide as many notes as they are old or just hide as many as possible. Your kid will be excited everytime they find a new note! The fun thing about birthdays is that your kid is one year older, that means they have lived 365 more days and have learned a lot. Start a tradition of interviewing your kiddo on their birthday and record it or write down their answers. Ask them what they have learned in the past year, what their most memorable moment was, what is something they wish they would have done, and so on. It’ll be fun for them to look back on these videos when they are older to see what they learn and what they were like. Be sure to do this each birthday, even when they become a sassy teenager who doesn’t want to sit in front of the camera. Balloons are fun for people of all ages! Surprise your birthday kid with balloons. You can fill their room with balloons while they sleep so that they wake up to a colorful and exciting scene. Or you could fill the living room and kitchen with balloons to give them a fun surprise as they come in for breakfast. A balloon avalanche is another great way to create a balloon surprise. To do this, blow up a ton of balloons and use some type of plastic or a sheet to contain the balloons in your kiddos doorway. Tape the sheet or plastic along the doorframe to keep it in place. When your child opens the door in the morning they will be surprised with balloons falling toward them! While gifts are fun to get as a child, it is not the most important part of a birthday. Starting at an early age, try to not make the birthday about the gifts, make it about the experience. Whether you only give your child one gift or ask their friends not to bring gifts, this can help make a birthday more special. Birthdays are about celebrating another year lived fully and growing older, it should be about what toys your kiddo will get that they will not play with in a year. If you need birthday party ideas, we’ve got you covered! Jumpin’ Jamboree is the best place to host your child’s birthday. Our fun, exciting, and totally awesome indoor inflatable playground is the perfect choice for your child’s birthday celebration! Not only do we offer party packages that can help make the planning process easier for you, but we have thousands of square feet of inflatable slides, obstacle courses, and bouncy houses that your kid and all of their friends will love! 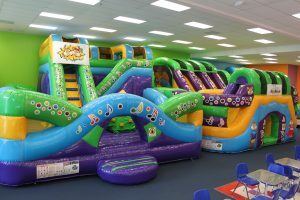 This is a fun birthday place that will allow all of the kiddos to burn some energy and stay active. If you are looking for a completely unique and incredible place to plan your child’s birthday party, look no further! With two locations in Kendall and Doral, you will be able to plan your kid’s party at one of our inflatable playgrounds that is closest to you! We will help with decorations, provide food and drinks for the kiddos, and we can setup and cleanup! This is the ultimate birthday place! If you are searching for ideas for your kiddo’s birthday party, this is the perfect place to start. End the night with your child’s favorite movie (or game if they prefer that) and spend a little more family time together. This is a great way to unwind and relax before the day ends. Make some popcorn, get the kids some candy, and watch a movie all together to end the night to a perfect birthday. Making your child’s birthday extra special doesn’t have to be difficult, just make them feel loved and extra special on their big day. These tips can help you get started! If you are still searching for birthday party ideas for your kiddo, contact Jumpin’ Jamboree. We can give you more information about our party packages and help you start planning the best birthday party your child has ever had!